Closed Saturday, Sunday, and major holidays. Are K&M products American made? The majority of our products are American-made and have been for over 50 years. We do purchase some product abroad when circumstances dictate we do so. The features and design of products are subject to change without notice. The naming of original manufacturers are for reference only. All parts shown are not original manufacturer parts. We make no claim in whole or part to be connected with, sponsored, and affiliated with or to be a manufacturer of OEM parts for the manufacturers named on this website. Retail customers may create an account in the check-out process and place an order at any time. 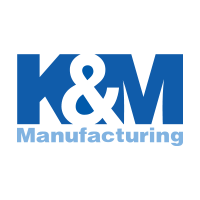 K&M Manufacturing holds nexus in the states of Alabama, Colorado, Connecticut, Georgia, Iowa, Illinois, Indiana, Kentucky, Louisiana, Maryland, Michigan, Minnesota, Mississippi, North Carolina, North Dakota, Nebraska, New Jersey, Nevada, South Carolina, South Dakota, Texas, Utah, Washington, Wisconsin, West Virginia, and Wyoming. We must charge sales tax in these states. Residents of these states must call the K&M Sales Team at 800.328.1752 if you wish to make your purchase tax exempt. A completed “Certificate of Exemption” form is required prior to shipment. The total cost of your order is equal to the price of your items, plus shipping costs, plus sales tax for orders shipped to Alabama, Colorado, Connecticut, Georgia, Iowa, Illinois, Indiana, Kentucky, Louisiana, Maryland, Michigan, Minnesota, Mississippi, North Carolina, North Dakota, Nebraska, New Jersey, Nevada, South Carolina, South Dakota, Texas, Utah, Washington, Wisconsin, West Virginia, and Wyoming. We currently accept Visa, MasterCard, American Express, Discover Card, and PayPal as methods of payment for retail orders. Purchase orders are accepted on dealer orders only. Your credit card is charged at the time the item(s) are shipped. However, if your order includes item(s) shipped directly from the manufacturer, your card will be charged when the order is processed. Customer will be responsible for Broker Fee, Duties and Taxes. The appropriate fees will be added to the freight. RECEIPT OF ORDER Please inspect your order carefully upon receipt of merchandise. If a discrepancy exists, please contact us immediately. Please double-check your order carefully, as smaller items are sometimes packed inside larger items. Retail shipment charges will be added to your order at time of placement. If I have an item shipped by truck freight is the driver responsible for unloading the merchandise?